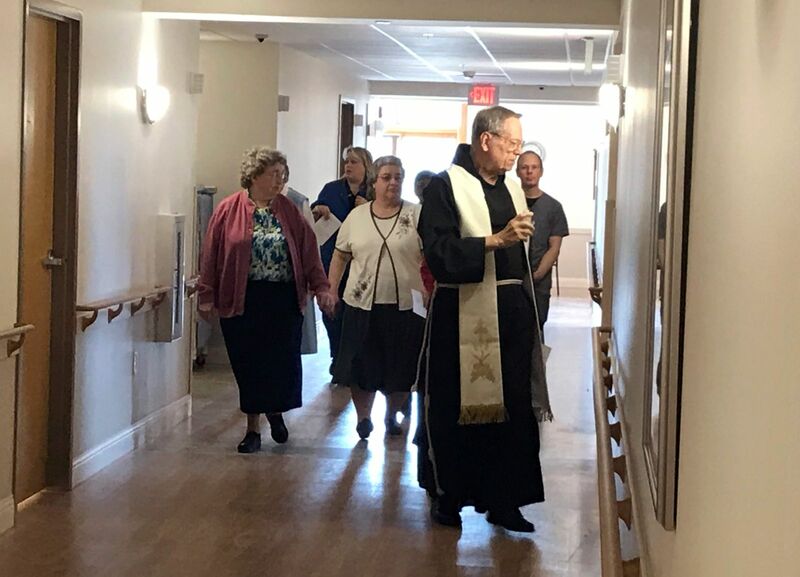 This morning, the new Loretto Home - our 32 room nursing care facility - was blessed by Father Dennis Koopman. 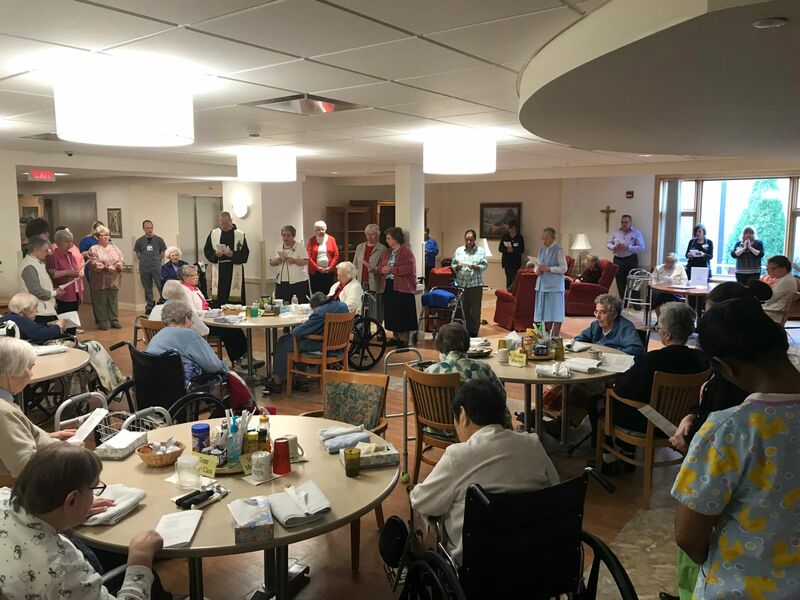 The buildling was constructed in 2004 and originally named Telgte - in honor of the city in Germany where the Hospital Sisters of St. Francis was founded in on July 2, 1844 - and previously was one of the residences of Sisters at St. Francis Convent. Our Loretto Home is named in honor of The Holy House of Loreto (Loreto, Italy) - a Basilica known for enshrining the house where the Blessed Virgin Mary is believed to have lived in Nazareth, Israel. This is where the Archangel Gabriel announced that by the power of the Holy Spirit that Mary would conceive and bear a Son who would be named Jesus. Prior to 1295, the Holy House of Loreto was located in Dalmatia, Croatia and Recanti, Italy. Since 1295, the Holy House has been located in Loreto, Italy. Here at St. Francis Convent in 1934, the Sisters prepared a place where their Sisters in need of healthcare services would reside. Originally named Our Lady of the Angels, this area “is the home of our pioneer Sisters. The humble home where our Blessed Mother’s last years were spent was called Loretto, you know, so we all think this name is very fitting for the home of our dear old Sisters. Here they can, like our Blessed Lady, live their days in close union with Jesus in the Blessed Sacrament." (Our Community Bulletin: 1938) On April 14, 1971, the sick and convalescent Sisters who were being cared for at the Motherhouse moved to the second floor, west wing of the new complex, called Our Lady of Angels Infirmary. 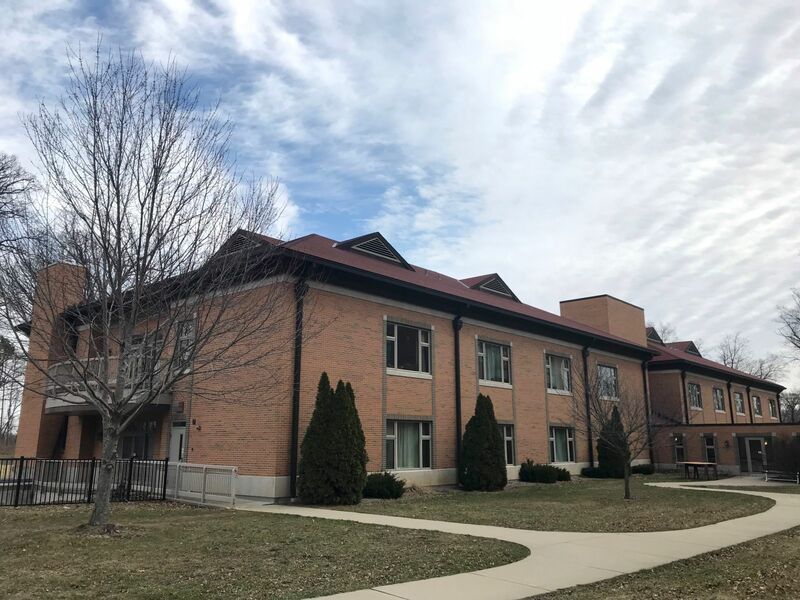 The following day, April 15, 1971, the aged and retired members of the community moved to the first floor, west wing of the new institution entitled Loretto Home. That 1970s building will be now be deconstructed in the upcoming months.